Welcome to Chelsea Manor an elegant country estate custom designed and built by Larson & Gardiner Associates. 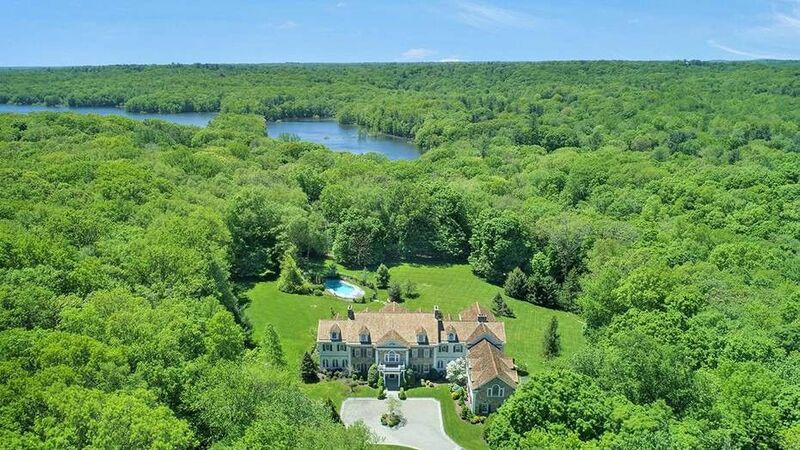 Impressive stone and clapboard Georgian-Style home set on 5 private, park-like acres with grand gated entry and formal courtyard, rolling hills, stone walls, mature landscaping and seasonal views of Laurel Reservoir. This home has rich architectural details, gracious ten-fourteen ft ceilings, 8 fireplaces, covered porches, slate patios, grand balconies, perfect symmetry and is optimally designed for comfortable living as well as, the most elegant formal entertaining both inside and out. Enjoy many amenities including full house generator,incredible home theater, gourmet kitchen, conservatory, luxury master suite w/his-her baths & sitting room,8 fireplaces, finished walk-up 3rd floor and Lower Level with game room,bonus room,sauna,full bath,hot tub & plentiful storage. Heated gunite pool. Identified tennis court and pool house sites. Entry Courtyard,Privacy, Rolling Hills, Stone Walls And Mature Landscaping.This Custom Built Home Has Rich Architectural Details, Gracious Ten Ft Ceilings, Perfect Symmetry And Is Optimally Designed For Comfortable Living As Well As, The Most Elegant formal Entertaining Both Inside And Out. Enjoy Expansive Property And Pool Views From The Wrap-Around Covered Porch, Blue Stone Terraces And Patios.Enter The Formal Foyer Through A Custom Mahogany Front Door To Find Soaring Ceilings, Marble Floors, Custom Arched Doorways, Crown Moldings, Palladian Window And Chandelier Feel A Sense Of History As You Gaze Up The Main Staircase, Featuring A Elliptical Arch Staircase With Spiral Balusters And Bracket Details Under Each Step Designed In The Tradition Of The Old Georgian Mansions. Home Features And Amenities- Master Suite With His And Her Luxury Bathrooms, Walk-In Closets, Wetbar And Refrigerator, Built-Ins, Large Sitting Room With Fireplace And Built-Ins, 14 Ft Ceilings In Large Master Bedroom. Fabulous Guest Suite With Sitting Area, Fireplace,Walk-In Closet Bar And Luxury Bath. Four Additional Bedrooms Each With Ensuite Baths And Walk-In Closets. Movie Theater Room With Stadium Seating And Wet Bar. Walk-out Lower Level With Family Room, Fireplace, French Doors, Game Room, Gym, Sauna And Full Bath Heated Fenced Gunite Pool,Private Beautiful Expansive Property. Sites For (But Not Included) Tennis Court and Pool House. Permits required.